And so are human beings. What the verse tells us is that we should use the silence of contemplation Òyèkúnméjì gives us to allow us to know our selves. It is a death to false ideas and ideals towards recognition of who we truly are. It even comes with an admonition of conducting ourselves with gentleness, in other words being through to our selves – which always has an effect of bestowing kindness on our surroundings – so our children can bless our memory and by taking our name in their mouth feel a healthy pride. If we act in such ways that we secure a good name in death we have acted good. Òyèkúnméjì is also the root cause of the condition we known as depression, a condition clearly referred to by the multiple meanings given to the word ‘dudu’ meaning ‘dark’ or ‘black’ in Yorúbá. But the challenge lies in not falling in love with ones depression or dark moods but use this condition to grasp our potential. Dark moods brings us towards the edges of our being, it is a condition where we feel alive because death is so close. It is the fire of protection rising within; this fire tells us that we are mud and clay (leaving out the fire of the soul). It is the cold fire of the black holes that tell us to break through and not be like a boat on shifting waters, but realizing yourself. 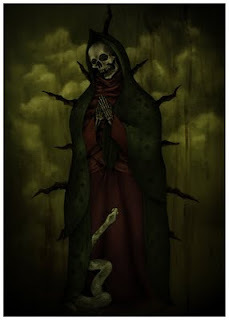 This is the Spirit of the Mother of Death, beware so you do not mistake Her spirit for being Death itself….